Can Wydad Add Salt To Sundowns’ Wounds This Weekend? This weekend, Mamelodi Sundowns will shift focus to their CAF Champions League group stages match against Wydad Casablanca. Pitso Mosimane’s charges started off their campaign with a 2-1 loss against Lobi Stars when they flew out to Nigeria last week Friday. This time around, they will be looking to collect three points at home, however, Wydad have been a tough contender for the Chloorkop-based side in recent times. Former South African striker, Alton Meiring got in on the matches that will be on our screens this weekend and made his predictions. Do you agree with his choices? Useful facts: After suffering a 2-1 loss to Lobi Stars away in Nigeria last Friday, Mamelodi Sundowns will be out to collect their first three points of their CAF Champions League campaign, although they will be well aware that it won’t be a walk in the park against the Moroccan giants. The two teams met twice in the group stage last year, drawing 1-1 in Pretoria, before Wydad getting the better of Downs in Morocco with a 1-0 scoreline. Games between the two sides have been hard fought and close contests and this one promises to be no different. Wydad put five past Ivorian giants ASEC Mimosas over the weekend and Pitso Mosimane’s charges will be wary of the visitors’ threat going forward while knowing that they can be vulnerable at the back if put under enough pressure. Three points is a non-negotiable for Sundowns at home, and the home crowd will need to come to the party big time to make the North Africans feel uncomfortable. 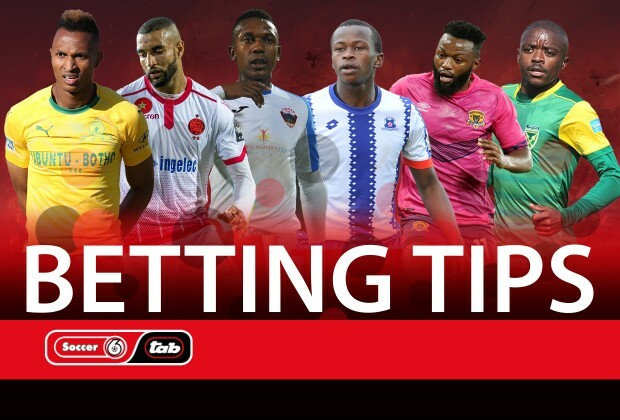 Useful facts: It’s a battle of the basement dwellers and whoever wins on the day will have gained three very valuable points as the fight to stay alive in the Premier Soccer League gains momentum for the two sides. Chippa United have been very disappointing so far this season and the fact they have the home advantage may not count for much. But perhaps having a new man in charge, in Clinton Larsen, may spur the players on and see them adopting a more positive approach, with an aim to impress the new man in charge. For Larsen, there is no time to settle in, as he would have known about the pressure he was getting himself into when accepting the job. Muhsin Ertugral is in an almost similar situation, having lost two out of two games since taking charge of Maritzburg United. The hot seat cannot get any hotter. A draw will suit neither side, as in that case, they will still be rooted in their current positions. Useful facts: Dylan Kerr has breathed new life into Black Leopards, having won three games on the trot since joining the club towards the end of last year. Playing at home, and on the back of the incredible 2-0 win over fast fading SuperSport United, they will be going for all three points. Mwape Musonda may particularly look too hot to handle. However, Arrows, with master tactician Steve Komphela now in the hot seat, will not be the lamb to slaughter and are expected to give it a good fight. Not much separates the two teams on the log standings and there is so much to play for – a win for Lidoda Duvha will see them leapfrog their opponents, while Abafana Bes’thende will walk into the Top Eight bracket with a victory.